Native juniper berries, which give mother’s ruin its unique flavour, are being saved from extinction. Michael McCarthy raises a glass to the Ice Age evergreen that put the UK distillery industry in high spirits. 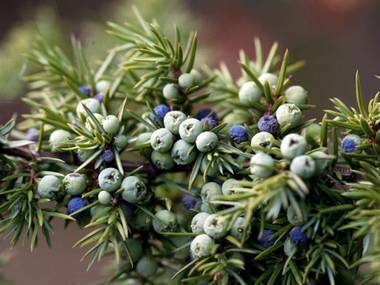 Gin drinkers, raise your glasses – the juniper, with its fragrant fruit, has been revived in Britain. Juniper berries are the essential flavouring ingredient in that clear spirit, whose evil reputation once gave it the name of mother’s ruin, but which is now seen more benignly as the interesting part of a gin and tonic. But the bushes that bear the aromatic berries have been disappearing across Britain, and in southern England have been in danger of extinction in the wild. Now, however, the wild flower conservation charity Plantlife has just completed the first phase of a major project to revive the fortunes of Juniperus communis, with 300 juniper seedlings growing at nine sites where existing juniper bushes were old and incapable of reproducing, a conservation success that has never before been achieved on this scale. Juniper is a fascinating plant in that it is one of only three native British conifers – the others are the yew and the scots pine – and it was one of the first trees to colonise Britain after the last Ice Age. Juniper numbers have fluctuated but on the whole declined over a long period, with many southern English counties having lost 60 to 70 per cent of their populations. Without action, the shrub (it’s generally shrubby-sized) was facing extinction here in the next 50 years, so in early 2010, Plantlife launched a conservation project and survey to help to save the species in the English lowlands. It has involved trialling new techniques to build up the most important populations across the chalk and limestone country of lowland southern England.